This kicks off with a vocal performance that's instantly irritating, bringing Green Day to mind and a shudder to the body. Tyson Ritter has all the irritating inflections of Green Day's Billie Joe Armstrong and that's a major negative. They're fake, nobody talks like that, why do they feel the need to sing like that? 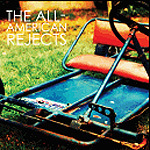 Musically, the All-American Rejects play breezy poppy sounds with a vague punk element and a drum machine that sounds somewhat out of place in a genre that always has some nut bashing away at his kit at the back of the stage. If you can get past the vocal style, then you might like this; it's Green Day or Weezer with a Beach Boys fetish and is a nice poppy alternative to the extremely juvenile rubbish clogging up the pop-punk scene these days. Alas, I can't get over the singing, it was bad enough when Green Day did it, but it's even more annoying to hear someone copy it. The Sorted magAZine discussion forum is back, just click on the text above.